First Atlantic Bank has officially signed an investment agreement with Advanced Finance & Investment Group, manager of AFIG Fund II to strengthen its capital base. The investment which has the approval of the Bank of Ghana is part of the bank’s strategy towards recapitalization before the end of the year. First Atlantic Bank is a full-service universal bank in Ghana which has been providing a wide range of banking services to corporate and retail clients for over 20 years. Since FABL’s transformation from a merchant bank to a universal bank in 2011, the Bank has quickly become one of the more established local banks with an extensive footprint and a robust financial position. AFIG Funds’ investment in First Atlantic Bank will strengthen the Bank’s capital and accelerate its transition to being a market leader. Karen Akiwumi-Tanoh, Chairman of the board of the Bank in her welcome address said, “we are glad to have attracted the backing of AFIG Funds at this critical phase in our growth. "We have been engaged with AFIG Funds for several years and are delighted to have gained their confidence in our business model and future financial prospects," she said. She added that the investment we believe will go a long way in strengthening their capital base and will better position the bank to continue delivering excellent service to our customers at home in Ghana and abroad. "As a financial institution, we also expect to benefit from AFIG Funds’ rich experience in strategic investing across the continent. "We sincerely welcome and acknowledge this signing ceremony as a significant step to future of shared prosperity and the economic advancement of our respective countries’’, she added. CEO of AFIG Funds, Papa Madiaw Ndiaye, said, “our Investment in First Atlantic Bank comes at an exciting time in Ghana’s economic evolution, where investor confidence is being restored on the back of solid economic growth prospects and an increasingly favourable policy environment. "It is no surprise that Ghana is expected to be Africa’s fastest growing economy in 2018. 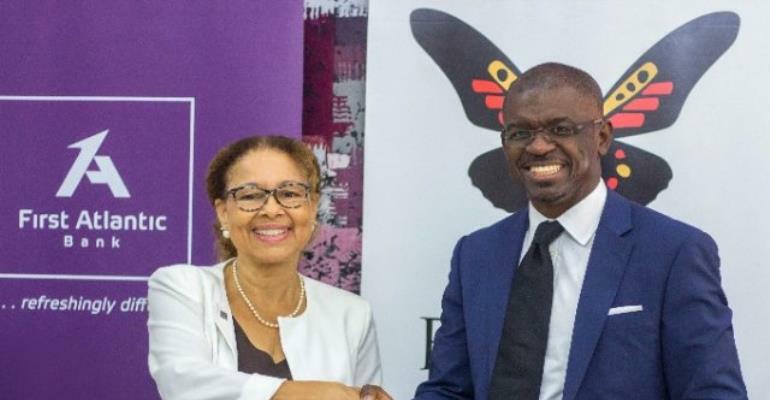 As a fund that has a long history of investing in and growing companies including banks across West, Central and East Africa, we consider First Atlantic Bank as one of the high-ranking financial institutions that we have invested in," he said. Mr Ndiaye believes the Bank has the capacity to become one of the leading financial institutions locally and possibly in West Africa, due to the capacity of its board and management team and the capital we are injecting into the bank. The Managing Director of the Bank expressed his appreciation to Mr Ndiaye and his management team for believing in the growth strategy of the bank. "We at First Atlantic Bank acknowledge the support and are more confident in our strategic roadmap to attain full capitalization and beyond by the end of this year per Bank of Ghana’s calendar.